Here is one of the oddest but most lucrative giveaways we have ever done! Rob’s mate Tom has booked a pre-paid two night stay at the Southern Ocean Lodge on Kangaroo Island in South Australia for next week, but won’t be able to go. He has grovelled to the hotel for leniency but it has refused. As the room (second highest suite category, Tom paid £2,000 per night) is non-refundable, he is trying to find someone who is or can be in the area from 2nd till 4th April to take over his room. Tom is not going to charge for this as the money is gone anyway and he feels it is better if someone stays in the room than giving the hotel the chance to resell and double its money …. So, if anyone is able to stay at the Southern Ocean Lodge next week, information on how to get in touch with Tom is here. The British Airways Special Services team, which will look after ‘every detail of the airport experience for [their] most premium customers’, has been renamed the ‘Concorde Team’. 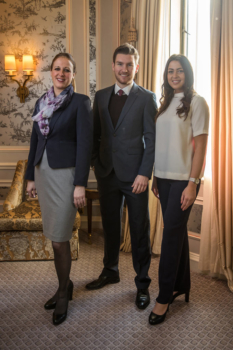 Concorde Team members will apparently undergo special training designed by The Dorchester and wear uniforms by luxury tailor M&S. Heathrow will be the first airport to offer the revised service with JFK to follow in the coming months. Finally, with a new month about to launch, I thought it was worth a reminder of the current generous Avios-earning deals available with Alan Boswell Group if you have insurance due this month. You can earn up to 20,000 Avios when you take out household, business or landlord insurance. The company is also now able to offer negotiated bonuses for very large policies. They told us that they recently did a special Avios deal for someone taking out a £5,000 household policy for example. The highest amount of Avios paid out so far in one transaction is 50,000. As a specialist insurance broker, Alan Boswell will give you best quote it can from the wide range of underwriters it works with. This means that it is very likely that it will be competitive with your current insurance quote as you will be getting the lowest price from across a wide range of providers. For business and household insurance, you need to ring Alan Boswell for a quote. The details can be found on this page of their website. Disclaimer: Head for Points is a journalistic website. Nothing here should be construed as financial advice, and it is your own responsibility to ensure that any product is right for your circumstances. Recommendations are based primarily on the ability to earn miles and points. In order to discuss and link to Alan Boswell on this site, Robert Burgess is registered as an Introducer Appointed Representative of Alan Boswell Insurance Brokers Ltd which is regulated and authorised by the Financial Conduct Authority. And the chap in the middle’s suit fits awfully – tight in the chest, sleeves too long (or shirt-sleeves too short), and trousers with a good inch or two extra at the bottom. The latter really does spoil the flattering full-length silhouettes which suits should offer. A bit like me dressed for a job interview in my younger years 🙂 These days people in my industry tend not to wear suits for interviews. Also it’s 2018, why are the women still expected to wear heels when their jobs will require lots of walking, steps etc. Give the girls some smart flats! Do you know for a fact that’ll they are? Or did you just see the promo photo, make an assumption and use it as the basis for a rant? O/T, have achieved my BAPP 241 a few months early, so want an option to earn maximum Avios for the intervening period, would I be right in thinking that the Amex Plat, via referral (35,000 + at least 2000 from card spend) would be my best option? and the gold and platinum companion credit cards (different from sup) and cancel supplementary and companion before upgrading or they will be carried forward and you will lose the opportunity to repeat with platinum. Quick question do you get 3k points for each and every supplementary cardholder you add on Platinum? Just the 1st, and only the 1st one is free. I don’t know about the points but I think there’s a hefty fee for extra supplementary cards. After the first one, which is free. I think it is £140 a card for additional ones. I thought the figures were 5k and £170? I just added my MIL for a gold card on our platinum card and got 5k – no fee. 5k for 1st supplementary on platinum. Do you have to wait to be offered this from Amex or will it automatically be applied regardless? No, because the only reasonable way to fly to BCN is over France. Western Spain you’d have a point (can be routed over Ireland) but BCN is just too close to the border for anything else to be reasonable. Other airlines were affected too. “Extraordinary circumstances” gets them out of having to pay you compensation, but it doesn’t get them out of having to provide you care (food/accommodation) and YOUR choice of refund or rerouting. OT can’t remember if it’s been mentioned before but do Thames water take amex, paypoint or through PayPal? That’s the first time I’ve heard M&S be called a luxury tailor! May not be ‘luxury’, but M+S is stil well outwith my price range, except during sales. O/T, have a BAPP 241 waiting, plus a pile of avios and approx. 250k MR points to burn. My +1 and I fancy India in Oct/Nov 2018. Anybody have any recommendations vis a vis flights? N.b. I’m a redemption newbie and any insight into the myriad plane class/seat configurations flown by BA forecast for then would be much appreciated. Also, I have never flown First and that was kinda the point in building a points stash but it’s not an absolute as it would, I think, rule out Bengaluru. Sorry for the probably unhelpful answer but I’d encourage you to do your own research. Where do you want to go in India? Ie into and out of where. For how long? Check BA availability to use the 241. Compare that to cash prices you’d be willing to accept (ex UK or ex-EU). The ITA matrix / google flights may come in handy. Perfectly fine answer Genghis. Research is the issue, Q: “where do you want to go then?” A: “India” is all I have to go on. For the first time in a long while I’m not being told to be somewhere and working the parameters accordingly – I have the time, the points, the cash, and there’s just too much choice! First world problems eh? Bangalore, Kerala, Cochin is a good triangle tour. Kerala backwater cruises where you stay for a night or two on your own converted houseboat are superb… Then pop over to the Maldives…. A South India tour is good during these months, beware of rains as well. Bangalore, Kerala tours….How about Andaman/Maldives ? North India is also good weather-wise. Delhi, Jaipur, Agra. We used a 2-4-1 to go to India a couple of years ago. We flew F to Mumbai and J from Delhi back to the UK (taking a prebooked internal from BOM to DEL). We took the view that we wanted a daytime F flight (rather than sleeping through it!) and the 10am (ish) BA flight fitted the bill. Five days in Mumbai, a couple of days in Delhi and then took a prebooked tour around parts of Rajasthan with a driver and car (with a local guide meeting us at major cities). We took in Agra, Jaipur, Jodhpur and Udaipur and much in between. We flew back from the latter to Delhi before returning to the UK. We flew BA first to Delhi using a 2-4-1 a few years ago. We planned the flights around a 7 night tour of the golden triangle with Intrepid travel (paid using Tesco clubcard vouchers). Our first ever group tour and we had a wonderful time. India is fairly cheap to access in premium seats, either cash fare or by redemption on another programme such as QR. 102k return. I suggest this is a better option, however would never advise to convert MR to QR points – QR points can be picked up easily and QR availalbility can be poor. Other programs to consider are Etihad..
I’m planning to use one of my Amex PRG freebie LoungeClub passes in Moscow Sheremetyevo (SVO) terminal D. Has anyone been to, and would recommend (to/not to), any of the 5 alternatives (Classic, Blues, Gallery, Matryoshka, and Jazz)? I’m interested in shower facilities and comfortable seats, more than food/drinks. Thanks! I see that one of the little perks of BA Bronze status is being able to use business class check-in desks and priority boarding. Better than nothing, but BA is not clear as to whether that applies to others on the booking reference if you are travelling as a couple or family. Never had a problem with checkin or boarding always go on the highest status. Within reason you can bring who you want. Correct. I have Alex’s statement. Had great service from Newcastle over the years, a lattery Manchester – good news. Thank heavens they’ve seen sense. Don’t underestimate the meaning of this. When AC came in one of the first things he said was “you’ve still got call centres? Wow well they’ll have to go”. The fact that he’s lost the battle is a sign that the tide is turning. No, I do actually think that he knew the publicity would be awful (as was mentioned above, the news covered the decision) and that BA does not need any further bad publicity. I’d like to know this too. Potentially a way through billhop perhaps, but I’ve not thought how! Re Alan Boswell Group insurance: following on from the head for points reminder email in January, I contacted them to enquire whether they would honour the gifting of Avios even though my house insurance was not due for renewal until later in 2018. They confirmed that they would, and they took contact details. Unfortunately, because I don’t live in a mansion, the premium I was advised of was only £260 odds, and I was told that there was a minimum premium of £500 to qualify for Avios. Subsequently I arranged my insurance through a different company, but I feel I have been conned. Very nice looking presentation of people.